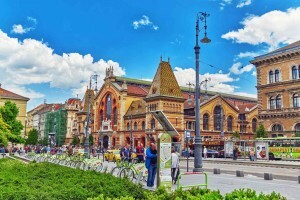 Discover the magic of Budapest with AESU. Hungary’s capital and biggest city, Budapest, is a marketplace of cuisine, culture, history and art. Cited as one of the most beautiful cities in Europe, Budapest is home to 80 geothermal springs, the world’s largest thermal water cave system. The city’s World Heritage Site includes the banks of Dunabe, the Buda Castle Quarter, and the Millennium Underground Railway. Every year, the city attracts about 4.4 million tourists, making Budapest the 25th most popular city in the world. Pálinka is a fruit brandy invented in the middle ages. The beverage is protected as a geographical indication of the European Union, so only fruit spirits produced and bottled in Hungary and 4 other provinces in Austria can be called pálinka. Take part in the Budapest Pálinka Festival, located in Városháza Park, and sample 300 types of the Hungarian brandy in one of the city’s most historic sites. Budapest was built on a Limestone basis, in which the heated water formed a giant system of caves, thought to be more than 120 km long. Explore the Castle, the Pál-völgyi, and the Szemlő-hegyi caves and take in the beauty of their stalactites. Visitors gaze in awe at their sparkling crystal formations by the light of a flashlight. Budapest sits on a network of almost 125 thermal springs. Depending on if you’re looking for a community experience or a more private dip, Budapest has a thermal bath for you. Enjoy centuries old architecture or splurge in an upscale spa located under a canopy of tree branches and flowers. When you want to explore the city’s culture, but don’t want to spend a perfect day indoors, get the best of both worlds with Budapest’s open-air museums. Take in the fresh air while enjoyed a free walk through Memento Park. Take a look at Hungary’s communist past with statues of Lenin, Marx, and Engels. Or look further back into history and spend the day at the ruins of Aquincum, where Budapest once stood an ancient city that was an outpost of the Roman Empire. AESU offers several trips to Europe, including the Cosmopolitan, Euro Spree, Explorer, Euro Focus, and our most popular tour, the Great Escape. Explore Hungary and its rich history and culture. Visit Austria and Hungary’s stunning capital cities with the Euro Explorer! If you have any questions or want help booking your next Hungarian adventure, please contact AESU by calling 800-638-7640, or fill out the contact form found on our website! This entry was posted on Wednesday, September 21st, 2016	at 2:36 pm	. You can follow any responses to this entry through the RSS 2.0	feed. Both comments and pings are currently closed.